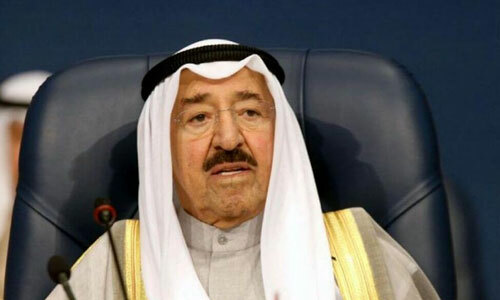 His Highness the Amir Sheikh Sabah Al-Ahmad Al-Jaber Al-Sabah on Thursday sent a cable of condolences to Indian President Ram Nath Kovind, expressing sincere grief towards the victims of floods and landslides due to the monsoon rains on the state of Kerala in southwestern India. His Highness the Amir wished the injured a quick recovery and officials in the friendly country to overcome the effects of this natural disaster. His Highness the Crown Prince Sheikh Nawaf Al-Ahmad Al-Jaber Al-Sabah and His Highness the Prime Minister Sheikh Jaber Al-Mubarak Al-Hamad Al-Sabah sent similar cables to the Indian President. National Assembly Speaker Marzouq Al-Ghanim also sent two cables on Thursday to Speaker of the Indian House of the People Sumitra Mahajan and Chairman of the Council of State Venkaiah Naidu to express condolences over the victims of floods and landslides that hit the southern state of Kerala recently. Thanks H H Amir of Kuwait, for your kind concern and for your kind words of solace. Received with very happy and thank you so much the concern over Kerala.May god shower you blesses. May ALLAH Bless u our beloved HH Amir of Kuwait. Thank you sir, His Highness the Amir of Kuwait for his concern over Kerala floods In India. God bless u and your country. Thank you so much for kind concern and care. gold bless you..